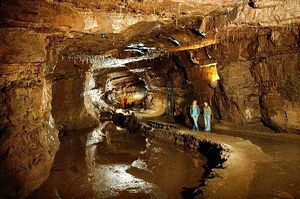 Created 350 Million years ago, the National Showcaves Centre for Wales, is situated in the Brecon Beacons National Park and was recently voted Britain's Finest Natural Wonder. With 10 differnt attractions on the one ticket there is plenty to do and see for all ages! We now have over 100 life-sized dinosaur models - making us one of the largest dinosaur parks in the world! Travel back to Jurassic times in Britain's largest Dinosaur Park. Come face to face with a 9.1m tall Tyrannosaurus Rex, and over 40 other prehistoric giants. Dinosaurs of all shapes and sizes inhabit our park! Learn their story of this exciting but deadly time! Great entertainment for all the family - includes our award winning showcaves where you can retrace the steps of the famous Morgan Brothers. These cave explorers were local farmers whose original efforts led to the creation of the most spectacular showcave complex in Northern Europe. Here Twm our 'talking sheepdog' will take you on a fascinating journey back in time to when Shire horses reigned supreme at 'Dan-yr-Ogof Farm'. Meet Dai our blacksmith and visit Tommy Morgan in his Victorian kitchen. See our magnificent shire horses, and the farm wagons they still pull around the farm. The other farm animals are never far away! Make friends with our Shetlands, donkeys, Welsh cobs, Alpacas, cows, goats, pigs, ducks and geese! Finally meet sleepy young Megan in the farm shop, and learn about her duties all those years ago. Also on the complex is a Ski-Slope.